The original GOmeb Razor (REVIEW) came to me when I needed a lightweight trainer. It was a solid shoe that rivaled the Kinvara with a better fit and a more responsive feel. I couldn't help feeling though that Skechers Performance was missing a solid long distance racer as the original Razor felt a little heavy for racing. Along came the Razor 2 and that has completely changed. I have used this shoe as my primary distance workout shoe and in my first marathon (that I found out I was running 9 hours prior). My first marathon experience at CIM was to be the women's Sub 2:45 Olympic Trials qualifying pacer. With a hard tempo on my legs the day before, I still managed to easily run 2:44:26 and pace several women under the standard. I attribute a great deal of this to the Razor 2. During the race they never felt like they bottomed out and felt protective yet responsive when I sprinted the last 100m. So let's go into a little more detail on this distance racer. 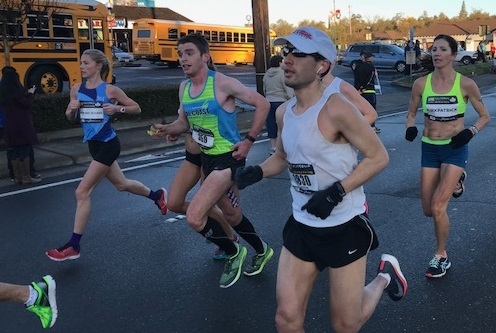 GOmeb Razor 2s at work in my first marathon and first time as a pacer. As with many Skechers Performance shoes, there is continued use of the GOknit upper. This version is much smoother than previous and hugs the foot very well. 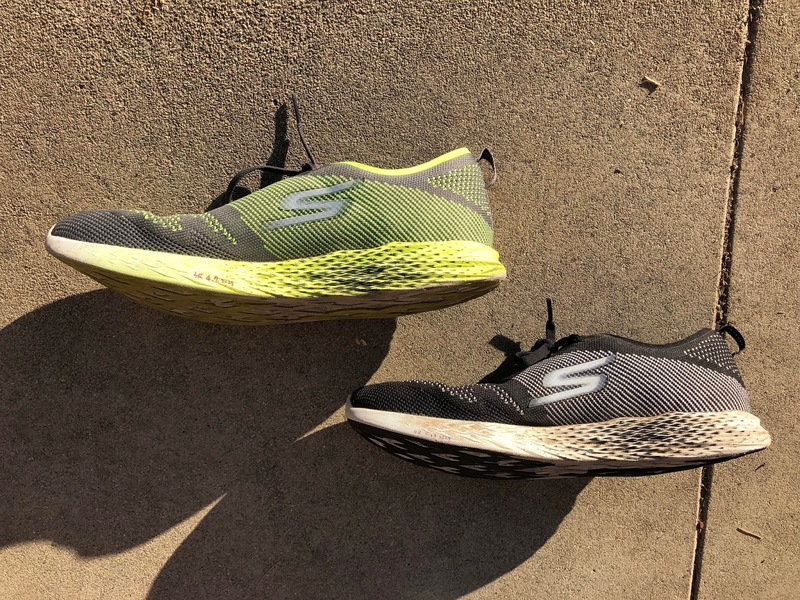 The previous version ran a bit wide, whereas this version runs a little more narrow than other Skechers Performance shoes due to the racing fit. The upper stretches very well but definitely holds the foot snugly. During the marathon, the upper disappeared on my feet and I had no hot spots or blisters. The laces are well connected to the upper and really help dial the fit in. Some people may have to relax them a bit while others will feel right at home cinching them down. The upper is fairly soft and a bit unstructured (but better than previous). This took some getting used to at first until the later versions firmed up the upper a little. The densities of the upper change depending on where more support is needed. As long as the laces are tied down well, my feet do not slide around. Taking sharp corners is probably not the best in this shoe but this was somewhat corrected in a later version. There is a little more of a heel counter in the posterior section of the shoe. It is still very minor and a majority of people will not notice it. For those that have sensitive feet to hard aspects of the upper, this is a great shoe to take a look at. 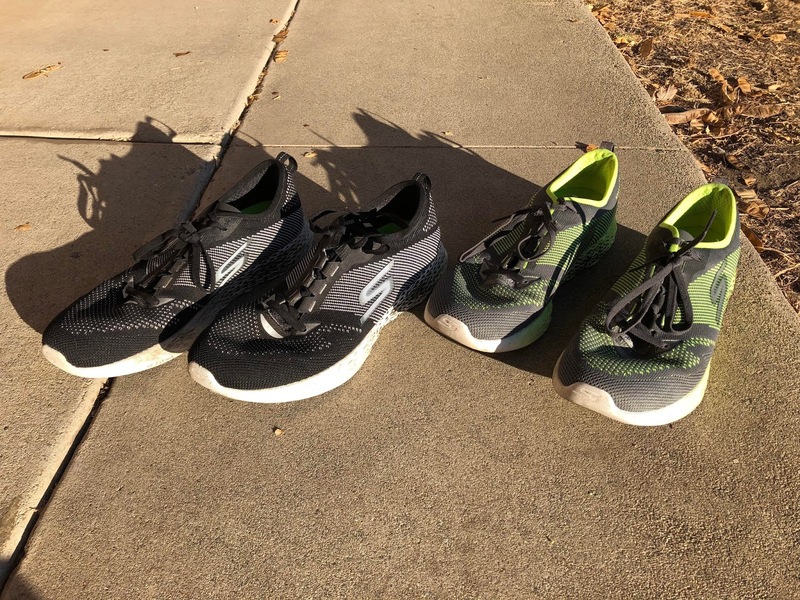 As with the other 2018 Skechers Performance shoes, the midsole has been updated with FLIGHT GEN. Gone is the semi-firm ride that deadens after 150 miles. Now is the mildly soft AND responsive sole that just seems to keep going. FLIGHT GEN definitely has some rebound in it and this was the first faster shoe I tried with it (and I love it). The sole is very protective for longer racing yet responds well even when I have used them for speed workouts. I have used both my pairs for extended periods of time and have 185 miles on one pair. Although the sole is wearing down, the worn pair still feel great and I have continued to use them (but will likely retire them before 250 miles as I chew through outsoles). The previous version wore down far faster, so durability has improved on the outsole and the sole continues to maintain its integrity. The somewhat unstructured upper and sole make it perfect for those that want a no nonsense racer. 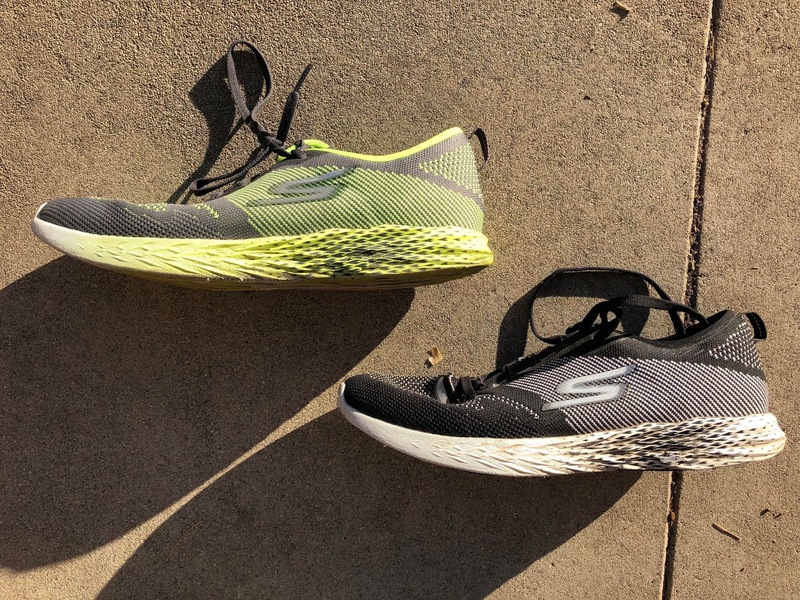 For those that need some stability, orthotics actually fit well in the shoe and there will be a similar light stability shoe with a similar weight coming in 2019 (stay tuned). Despite needing a little stability (which is why I like the GOrun Forza 3 so much), I did fine during the marathon and during all my longer workouts. The sole maintained the responsive/soft feel throughout the 26.2 miles and felt good enough for me to sprint at the end. Black pair has 185 miles, Yellow Pair has 110 miles. The ounce weight drop compared to the previous version (7.7 oz to 6.8 oz) is very noticeable, especially when the pace picks up. A great deal of this is from the midsole switch to FLIGHT GEN, which only further adds to the faster ride. The GOmeb Razor 2 now feels like a racing shoe that should work well as a long or even mid distance racer for some and a very lightweight trainer for others. It is definitely more of a racer than lightweight trainer although many will still get away with using it as the latter. For those that are not used to lighter shoes, the Razor 2 may work as a 5k to 10k shoe if you are looking for a little bit more protection than the traditional ultra light 5 oz racers. The heel drop is on the lower end at 4mm (ish). However with the insole in, it feels more like a 6mm drop shoe. This is splitting hairs, but for those that like that low drop (but not 0mm) this is a great level. For others that need a bit more, a simple trick I often use is to cut the back off another pair of insoles and place them under the heel to increase the drop (I used to do this with Altra running shoes). I am at a point in my Orthopedic Residency where I have learned no nonsense is often best. Taking a simple approach to things is often more effective and I have made the mistake of over complicating things in the past. The GOmeb Razor 2 reminds me of why keeping things simple is often good. The shoe fits well, the sole responds well and there are no extra unnecessary frills. My one thought with a long distance racer is that I do wish there was some kind of plate to stabilize the sole a little more. This is a request that has obviously evolved with the frequent use of plates in road racing shoes that has only become more popular with the Adios, Vaporfly, GOmeb Speed and many Japan only racing shoes. I personally like them because they not only give a little more structure to the sole, but they (if used correctly) can facilitate some of the normal mechanics of the foot. That being said, if they are done incorrectly (put in the wrong spot, too stiff, etc), there are some problems that can occur. I have had several patients in the last few months come in with issues from the recent Nike Vaporfly craze. While many people will not have this issue, the foot does need to move, particularly at the midfoot and toe joints. If these plates are too stiff, some of the natural foot motion will be limited. While I understand that the ultimate goal is to improve efficiency (hence 4%), there are still some areas that need to be allowed to move. The talocrural joint (ankle joint. also called tibiotalar joint) is an obvious joint that needs to move to allow the ankle to dorsi and plantar flex throughout the gait cycle. I have talked before about the MTP joints at the toes and how they need to be able to dorsiflex (extend) to allow the body to transition over them during toe-off. A point I do not mention as often as I should is that the midfoot should definitely move. This tends to be the "shock absorbing" set of joints where the foot attenuates a great deal of impact forces. People tend to fixate on stabilizing this area as a portion (yes portion... not all) of pronation occurs there. Pronation needs to occur for normal foot motion. It is one of the many important ways the body absorbs shock. If you pronate too much, that may be a problem. However research is actually mixed on this and some studies even suggest that pronation is protective AGAINST injury. This simply speaks to the fact that injury prediction is multi-faceted and may not be predictable from looking at a single joint or even body part. So I would like to see a plate in the future GOmeb Razor to stabilize the sole and facilitate propulsion now that it is more of a racer, but that is a personal request. As always, different shoes will work for different people, so you need to find what works for you. As I just mentioned, I would like to see some kind of propulsive plate in this shoe simply because it is a racing shoe now. I hope Skechers also includes their new FLIGHT GEN midsole material in the shoe, but I have heard rumor that the current sole is actually a mix (will have to confirm). Especially since the new GOmeb Speed 5 is definitely a fast racing flat (review soon) that will work well for mile to 10k races (half marathon at most for me), the future Razor may do well with a little more structure to follow suit as a long distance racer. Like all the shoes in the Skechers Performance 2018 line, the GOmeb Razor 2 has evolved. It is now a fast, no nonsense distance racer that will work up to the marathon yet has the speed to handle shorter workouts. Some may be able to use it as a very lightweight trainer but the 6.8 oz weight definitely lends to racing more. The upper is very comfortable although runs a little narrower. The sole is bouncy, flexible and will give you just enough protection over long miles. As I said, I used this shoe at the last second for my first marathon and came away with no blisters and very happy feet/legs. Excited to see what happens when I go after my first competitive marathon (not as a pacer) and these will likely be on my feet during that time (later in 2018). ***Disclaimer: These shoes were provided free of charge in exchange for a review. I put at least 75 miles on trainers and 25 miles on racing flats. Currently my pairs of GOmeb Razor 2s have 185 and 112 miles on them. A big thank you to Skechers Performance for including me in the development of such fantastic performance shoes. The Skechers GOmeb Razor 2 will be available January 2018. I hope this and the rest of the Skechers Performance 2018 line convince local running stores to consider carry this brand.